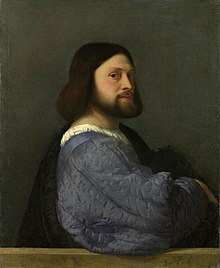 Tiziano Vecelli or Tiziano Vecellio (pronounced [titˈtsjaːno veˈtʃɛlljo]; c. 1488/1490 – 27 August 1576), known in English as Titian /ˈtɪʃən/, was an Italian painter, the most important member of the 16th-century Venetian school. He was born in Pieve di Cadore, near Belluno, then in the Republic of Venice). During his lifetime he was often called da Cadore, taken from the place of his birth. Titian never attempted engraving, but he was very conscious of the importance of printmaking as a means to expand his reputation. In the period 1517–1520 he designed a number of woodcuts, including an enormous and impressive one of The Crossing of the Red Sea, intended as wall decoration in substitute for paintings; and collaborated with Domenico Campagnola and others, who produced additional prints based on his paintings and drawings. Much later he provided drawings based on his paintings to Cornelis Cort from the Netherlands who engraved them. Martino Rota followed Cort from about 1558 to 1568. Titian employed an extensive array of pigments and it can be said that he availed himself of virtually all available pigments of his time. In addition to the common pigments of the Renaissance period, such as ultramarine, vermilion, lead-tin yellow, ochres, and azurite, he also used the rare pigments realgar and orpiment. Titian's wife, Cecilia, was a barber's daughter from his hometown village of Cadore. As a young woman she had been his housekeeper and mistress for some five years. 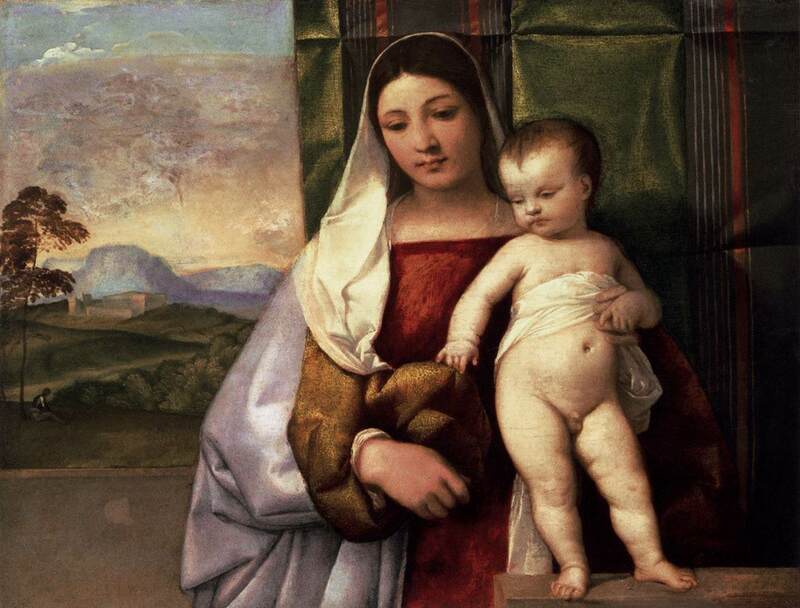 Cecilia had already borne Titian two fine sons, Pomponio and Orazio, when in 1525 she fell seriously ill. Titian, wishing to legitimize the children, married her. Cecilia recovered, the marriage was a happy one, and they had another daughter who died in infancy. In August 1530 Cecilia died. Titian remarried, but little information is known about his second wife; she was possibly the mother of his daughter Lavinia. Titian had a fourth child, Emilia, the result of an affair, possibly with a housekeeper. His favorite child was Orazio, who became his assistant. 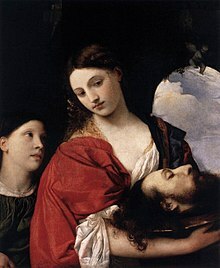 In August 1530, Titian moved his two boys and infant daughter to a new home and convinced his sister Orsa to come from Cadore and take charge of the household. The mansion, difficult to find now, is in the Biri Grande, then a fashionable suburb, at the extreme end of Venice, on the sea, with beautiful gardens and a view towards Murano. In about 1526 he had become acquainted, and soon close friends, with Pietro Aretino, the influential and audacious figure who features so strangely in the chronicles of the time. 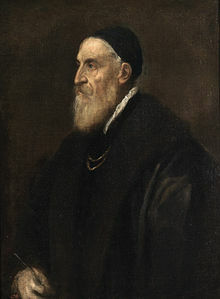 Titian sent a portrait of him to Gonzaga, duke of Mantua. When he was very young, the famed Italian painter Tintoretto, was brought to Titian's studio by his father. 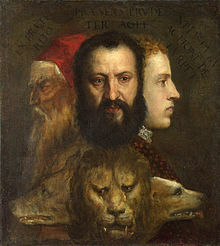 This was supposedly around 1533, when Titian was (according to the ordinary accounts) over 40 years of age. Tintoretto had only been ten days in the studio when Titian sent him home for good, because the great master observed some very spirited drawings, which he learned to be the production of Tintoretto; it is inferred that he became at once jealous of so promising a student. 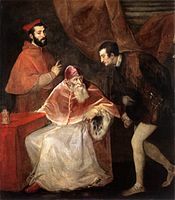 This, however, is mere conjecture; and perhaps it may be fairer to suppose that the drawings exhibited so much independence of manner that Titian judged that young Jacopo, although he might become a painter, would never be properly a pupil. From this time forward the two always remained upon distant terms, though Tintoretto being indeed a professed and ardent admirer of Titian, but never a friend, and Titian and his adherents turned a cold shoulder to him. There was also active disparagement, but it passed unnoticed by Tintoretto. 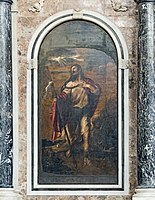 Marco Vecellio, called Marco di Tiziano, born in 1545, was Titian's nephew and was constantly with the master in his old age, and learned his methods of work. He has left some able productions in the ducal palace, the Meeting of Charles V. and Clement VII. in 1529; in S. Giacomo di Rialto, an Annunciation; in SS. 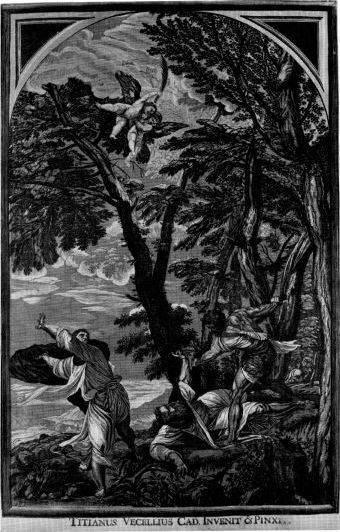 Giovani e Paolo, Christ Fulminant. A son of Marco, named Tiziano (or Tizianello), painted early in the 17th century. Few of the pupils and assistants of Titian became well known in their own right; for some being his assistant was probably a lifetime career. Paris Bordone and Bonifazio Veronese were his assistants during at some point in their careers. 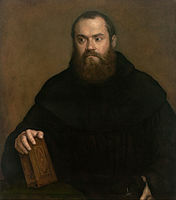 Giulio Clovio said Titian employed El Greco (or Dominikos Theotokopoulos) in his last years. Polidoro da Lanciano is said to have been a follower or pupil of Titian. Other followers were Nadalino da Murano, Damiano Mazza, and Gaspare Nervesa. Contemporary estimates attribute around 400 works to Titian, of which about 300 survive. 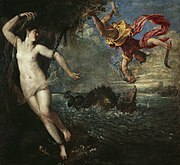 Two of Titian's works in private hands were put up for sale in 2008. 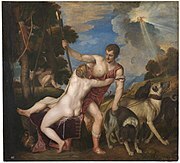 One of these, Diana and Actaeon, was purchased by London's National Gallery and the National Galleries of Scotland on 2 February 2009 for ₤50 million. The galleries had until 31 December 2008 to make the purchase before the work would be offered to private collectors, but the deadline was extended. 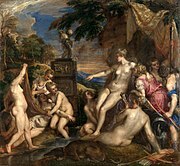 The other painting, Diana and Callisto, was for sale for the same amount until 2012 before it was offered to private collectors. The sale created controversy with politicians who argued that the money could have been spent more wisely during a deepening recession. The Scottish Government offered ₤12.5 million and ₤10 million came from the National Heritage Memorial Fund. The rest of the money came from the National Gallery and from private donations. This article incorporates text from a publication now in the public domain: Chisholm, Hugh, ed. (1911). "Titian" . Encyclopædia Britannica (11th ed.). Cambridge University Press. ^ Wolf, Norbert (2006). I, Titian. New York and London: Prestel. ISBN 9783791333847. ^ Durant, Will (1953). The Renaissance. The Story of Civilization. 5. New York: Simon and Schuster. p. 667. ^ "Portrait of Gerolamo (?) 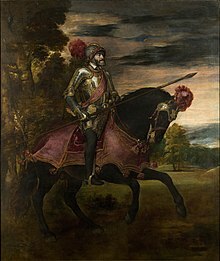 Barbarigo, about 1510, Titian". National Gallery. Retrieved 26 May 2013. Louis Gillet (1913). "Titian". In Herbermann, Charles (ed.). Catholic Encyclopedia. New York: Robert Appleton Company. Retrieved 30 January 2011. ^ "Titian Madonna and Child sells for record $16.9m". BBC News Online. 28 January 2011. Retrieved 30 January 2011. ^ Kennedy, Ian (2006). Titian. Taschen. p. 95. ISBN 9783822849125. ^ Jill Dunkerton and Marika Spring, with contributions from Rachel Billinge, Kamilla Kalinina, Rachel Morrison, Gabriella Macaro, David Peggie and Ashok Roy, Titian’s Painting Technique to c.1540, National Gallery Technical Bulletin, volume 34, 2013, pp. 4-31. Catalog I and II. ^ [Le maraviglie dell'arte: ovvero Le vite degli illustri pittori], Volume 1, by Carlo Ridolfi, Giuseppe Vedova, page 288. ^ Ridolfi and Vedova, page 289. ^ Boni, Filippo de' (1852). Biografia degli Artisti, Emporeo biografico metodico, volume unico. Venice (1840); Googlebooks: Co' Tipi di Gondolieri. p. 703. ^ Carrell, Severin (2 February 2009). 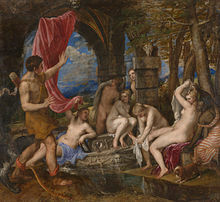 "Titian's Diana and Actaeon saved for the nation". The Guardian. 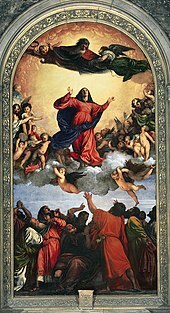 Wikimedia Commons has media related to Titian. Wikisource has the text of the 1911 Encyclopædia Britannica article Titian.